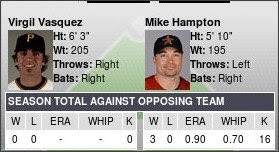 Mike Hampton sure likes pitching against the Bucs. Game time is at 8:05 and can be seen on FSN. Join us in the liveblog below. Go Bucs!